Austin is no stranger to charter schools. IDEA and KIPP campuses proliferate across the city, siphoning students and money away from our neighborhood public schools. Our previous superintendent attempted to hand over one of our neighborhood schools to IDEA (an effort that Education Austin members fought hard to defeat). This same superintendent, upon leaving Austin to take the helm in the Atlanta, attempted to shut down several campuses in the Atlanta Public School system, so they could hand them to charters. 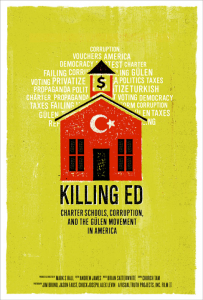 Please join Texas AFT & TSTA Saturday, May 21, for a special FREE screening at the Alamo Drafthouse Village of Killing Ed: A Documentary Film about Charter Schools, Corruption, and the Gülen Movement in America. Killing Ed is an in-depth, well-researched investigation of one of the largest charter networks in the U.S. and has been featured at international film festivals. Killing Ed shows audiences a shocking, first-hand look inside public charter schools while revealing the corruption of those attempting to privatize our public schools through education “reform” in America. The documentary also features the Harmony charter network in Texas. Previous Got Student Debt? Let’s Fix That! Next Do I Have to Pay for Lost or Stolen Textbooks?